The AER800-24P supports up to 24 loop extender card modules. This allows for simple installation, management, maintenance, and economy of deployment. Add 1 to 24 AER800-C1P, C1PL, C1PM, C1PLM or C1PV in any combination. Add 1 to 3 AER800-PWR (ADSL) or AER800-PWRV (VDSL) in any combination. Add 1 to 3 power supplies in the central office or customer premise. 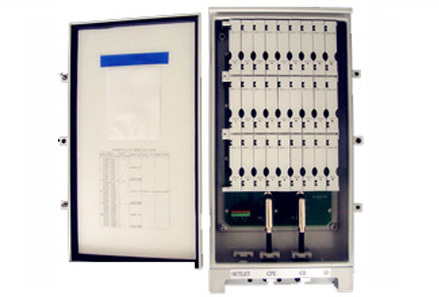 AER800-24P-BOX: 24 subscriber / 27 slot Enclosure. AER800-C1P: Express power module for Annex A, 1 subscriber per card. AER800-C1PL: Line power module for Annex A, 1 subscriber per card. AER800-C1PLM: Line power module for Annex M. 1 subscriber per card. AER800-C1PM: Express Power module for Annex M. 1 subscriber per card. AER800-C1PV: Express Power module for VDSL. 1 subscriber per card. AER800-PWR: Inserts into enclosure to power up to eight ADSL modules. Requires AEC-x power supply 122vDC. AEC-B1Px, AEC-B4Px or AEC-C2P: Installed at the CO to supply power to the AER800-PWRx card. Modularity allows you to expand your customer install base by adding new AER800-C1PLs.